The ultimate goal of education is to create inquisitive, independent learners. Teach your child to read, and he/she will soar. The gift of knowing how to read well is like giving your child a ticket for a free trip around the world—they become explorers who discover and grow. So how do you choose a reading curriculum? We’re so glad you asked! 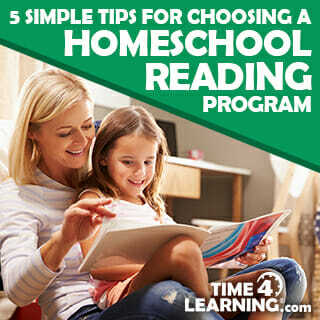 These 5 simple tips from the homeschool trenches will help you choose the best program for your child. First, a child needs to master all reading-readiness concepts; otherwise, he/she may struggle to learn how to read. You can assess your child’s level of readiness with Time4Learning’s handy Reading Skills Pyramid. Second, each child learns differently. Thankfully, one of the benefits of homeschooling is the freedom to teach in the way that your child learns best; therefore, understanding your child’s learning style is essential. Are you learning style savvy? Children typically learn through a combination of styles; therefore, regular observation will help you to pinpoint your child’s primary and secondary learning styles. Read about the seven different learning styles and compare the descriptions with the ways in which your child processes information best. There are a multitude of reading programs on the market, designed by both homeschool and non-homeschool publishers. So where do you begin? Homeschool.com is chock full of resources and reviews. In this Homeschool.com product review, you’ll find a list of curricula and programs broken down by ages. Select the age that matches to your children and enjoy learning what makes each program unique. Word of mouth speaks volumes, and I’m not just referring to other homeschool moms. Kids know what they like, and many would be elated to share their experiences with you. So, ask your friend’s children, or even your own, what their likes and dislikes are and why. As you research, take lots of notes. You may even want to assign a rating of one to five stars as a handy at-a-glance resource. Finally, it’s important that your chosen program addresses the five key areas in learning to read: phonemic awareness, phonics, comprehension, vocabulary, and fluency. Once you have a list of potential reading programs, request samples. Many educational publishers allow you to view demos online or offer free samples with a simple click of the mouse. Regional and statewide homeschool conventions are a great place to get an up close and personal view of a variety of programs. Designing a personalized reading program for your child might be the best choice. Not sure where to start? No worries. The Three R’s: Grades K-3 by Dr. Ruth Beechick will help you create a program to match your child’s strengths and ability. Then, as your child progresses, seek guidance from Gladys Hunt’s Honey for a Child’s Heart, a must-have book that not only provides oodles of age-appropriate book lists, but also shows you how to choose great books to help your child grow. Barbara Kruger, Literacy and Professional Development Expert for VocabularySpellingCity, suggests, “Many libraries today have leveled reading materials in the children’s section. Encourage your child to select several books from this area. Then, based on the various books’ topics, find additional resources in other sections of the library to supplement or expand your child’s learning on that topic.” Simply brilliant, Barbara! This may seem like common sense; however, it can serve as an angel on your shoulder when you’re feeling stressed and overwhelmed. Maybe your carefully chosen reading program simply isn’t working. Your child is frustrated and unhappy, and you feel lost. Knowing that you can change programs after only a month or even midyear is a blessing.